“Wake up, here’s your coffee!”, that’s what I hear from Tom at 3:48 am on September 6th of 2018. We must catch a 5:50 am flight to Salt Lake City and I’m NOT a morning person. The downside of planning the National Park trips so far ahead is that flight schedules change. The plus side, on this trip, is that we get to stay at the iconic lodge on the North Rim of the Grand Canyon and we got rooms in Moab (Arches and Canyonlands) Bryce and Capitol Reef during peak season, enabling us to bring our total to 47 Parks visited out of 59. My best childhood friend, Ginny and her husband, Bob, are joining us – always fun! But, they voted for the darn 5:50 am flight too. A 298-mile drive gets us to Moab, UT and one of the most expensive Best Western Hotels ever in a “less hip than I thought it was going to be” town. Along the way, the Nine-mile Canyon “side trip” introduces us to the Fremont peoples and their 1,000-year-old petroglyphs. Since the trick is to stay ahead of the crowds and heat (90+ degrees), we drive up and into Arches National Park early, again this morning. As we crest a knoll, suddenly we see our first glimpse of the magic of this Park. Courthouse Towers is lit by the morning sun. They are stunning, as are the surrounding rock formations! 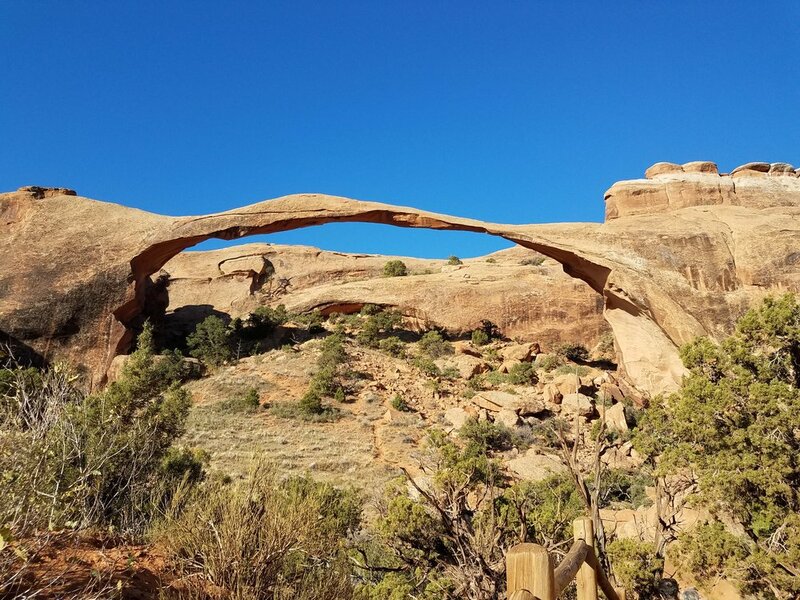 We reach the end of the road, at Devil’s Garden, and walk a scenic 1.6 miles out and back to Landscape Arch, the longest arch in the Park at 306 feet. The arch is a precarious 6 feet thick in some places after a large slab fell off back in 1991. The same thing that creates the over 2,000 arches (minimum of three feet) in this Park, water erosion and weathering, will eventually also destroy each arch. After our first walk, we opt for the 8-mile dirt road out to Klondike Bluffs, a more remote section of the Park. After scrambling up to the bluffs, we meander through this wonderland dotted with juniper, creosote, yucca, Mormon tea, desert holy and pinon pine, up to Tower Arch and don’t see another soul. The outstanding beauty shared with longtime friends is quite emotional for some – a good sign for a great trip. Arches National Park, designated in 1971, gets 700,000 visitors per year but is a small Park at 76,359 acres. This puts tremendous pressure on preserving the glorious landscape which is apparent as we join the crowds at Fiery Furnace and Sand Arch viewpoints. The heat drives us to the visitor center for air conditioning, a good movie, geological education and yes, my stamp. About 300 million years ago the area was covered by inland seas that evaporated and re-filled repeatedly creating a thick salt bed. Sandstone layers formed on top of the salt, over millions of years, putting tremendous pressure on the more unstable salt layer below creating a fault which forced the salt up forming a large salt dome. 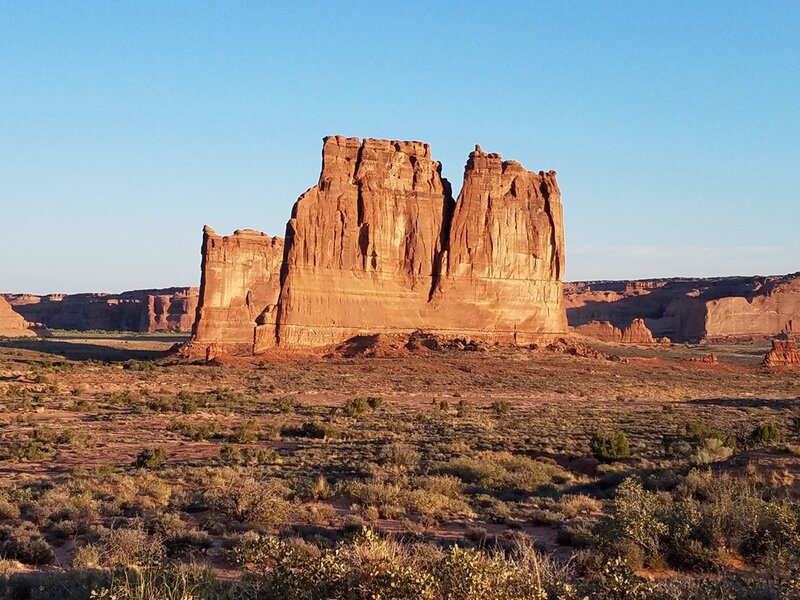 The salt dome caused cracks in the earth’s crust and those cracks have now been worn down by erosion and weathering to create the fins, arches, spires, balanced rocks and monoliths of Entrada sandstone, a porous red rock in Arches. The area gets nine inches of rain per year primarily in late summer. After the heat subsides, we complete our fabulous day back in the Park, at the Windows, for sunset. I just love being in the Parks after the crowds go home even though the view is hampered by a lone cloud this evening. Up and out early, again, on day three, for our superb 1.5-hour drive to the Needles unit of Canyonlands National Park, we choose a 3-mile dirt road to Elephant Hill. The six-mile trail (round trip) begins like yesterday, with a scramble up to a plateau. The mushroom rock formations are incredible as we pass from valley floor to rock formations to valley back to rock formations. Shade is limited, so, as a precaution, I turn back early. Signs that read “heat kills” are everywhere! Canyonlands National Park was established in 1964 and remains untamed. The Green and Colorado Rivers merge and divide the Park into three units; Needles, Island in the Sky, a 6,000-foot-high mesa, and the Maze backcountry unit. Canyonlands is in the heart of the Colorado Plateau where 20 million years ago an uplift began raising the ancient salt beds and layers of rock above. Since then erosion from the rivers and summer storms formed what we see today; canyons, mesas, buttes, fins, arches and spires. We’ve seen sunset and now we must see sunrise and we hear that Dead Horse Point State Park is the place to be. So, here we go again, up and out by 5:45 am! As we take the short walk out to the viewpoint in the dim morning light, it’s hard to comprehend the expansive and impressive 180-degree view of the canyons surrounding the Colorado River. We see lightning in the distance while clouds hang over the uplifted formations. Gradually the light encompasses the sky and melts the clouds away. After lingering with only a few others, we finally depart. As we drive up and into the Island in the Sky, it appears that an additional 2,000 feet (from 4,000 to 6,000 feet) gets us 10 degrees cooler. Our first stop, Mesa Arch, is tainted by a loud and invasive group not typical of National Parks. Our second stop, Upheaval Dome, a 2.5 mile walk over rocks guided by cairns, which has two amazing overlooks. Ginny has, by now, established an unusual love affair with cairns. Our hotel is the next stop since it’s nearly 100 degrees. This gives me a chance to research restaurants for our last night in Moab. So far, Zax, Pasta Jay’s and the Food Truck Park have been good, not great. I find Desert Bistro, a couple blocks from our hotel in a lovely renovated 1892 dance hall. Salads are incredible, and my tuna entrée is fabulous both in taste and presentation! Today is our 385-mile travel day to the North Rim of Grand Canyon National Park, established in 1919, so I finally get a reprieve from the early wake ups. Once in route, our first “side trip” is to the Valley of the Gods, recently removed as part of Bear’s Ears National Monument. As we enter on the dirt road, we immediately see some spectacular red sand stone formations – what a treat! The second “side trip” is to famous Lees Ferry on the Colorado River. I imagine the historical events in “The Emerald Mile” as I cool myself in the 53-degree water – it’s another 100-degree day. This is the only place where one can drive down to the River, between Glen Canyon dam and the western end of the Grand Canyon, so all raft trips (including the one I missed) launch here – exciting! As we drive up to the North Rim at 8,200 feet, temperatures drop to 70 degrees and vegetation changes from barren red rock to high desert ponderosa pine forest. Upon arrival, I practically run from the car to the iconic lodge, re-built in 1937 following a fire. Having seen pictures of the Canyon from the Lodge and it’s two decks, I simply can’t wait to see it firsthand. It exceeds my expectations! After checking in to cozy cabins #14 and #19 adjacent to the Lodge, Tom and I just sit in the adirondack chairs on the deck drinking in the magnificent view. Dinner in the beautiful historic dining room follows making it difficult for the food to surpass the setting. After dinner we are back out on the deck. The new moon appears after the sun sets, then Venus appears followed by other planets and more and more stars. Finally, the Milky Way tops the evening off. Incredible! Our first day on the North Rim, we decide to take the five-mile hike called Uncle Jim’s. Some uphill takes us through the ponderosa pine forest out to scenic canyon views. The Grand Canyon cuts one mile deep into ancient rock but is seven miles wide. The North Rim is 1,200 feet higher than the south, cooler and much less crowded because it’s hard to get to. It’s also further from the River because there is more erosion on this side. Many of the canyons we see over here are side canyons. Our second day at the Grand Canyon, most of the gang takes the famous Kaibab Trail partway down (2,000-3,000 feet) into the Canyon. Not being one for a big hike up, AFTER a big down, I do a six-mile loop up top. Everyone does well, especially Bob, with his new knee. Now the question is when and how we do the famous Rim to Rim hike – we’ll see. Sunset at Cape Royal Point is a fitting end to our spectacular Grand Canyon adventure. After we say our final good byes to the magnificent North Rim, we drive 160 miles to Bryce Canyon, originally our 28th Park. I can’t wait to get there and hike in the hoodoos (sick last trip). A great lunch at The Rocking V Cafe in the attractive town of Kanab, UT is our only stop. We introduce Ginny and Bob to one of our favorite Parks at the crowded Inspiration Point. We quickly get over to the rim and get down into the canyon via the Wall Street switchbacks to be with the hoodoos, – so fun! Once past the initial mile, the crowds disperse, as often is the case. A three-mile walk, the Queen’s and Navajo Loop combination, in the late afternoon light among these formations is spectacular and the UP isn’t too bad. Wow, I’ve waited three years for this! 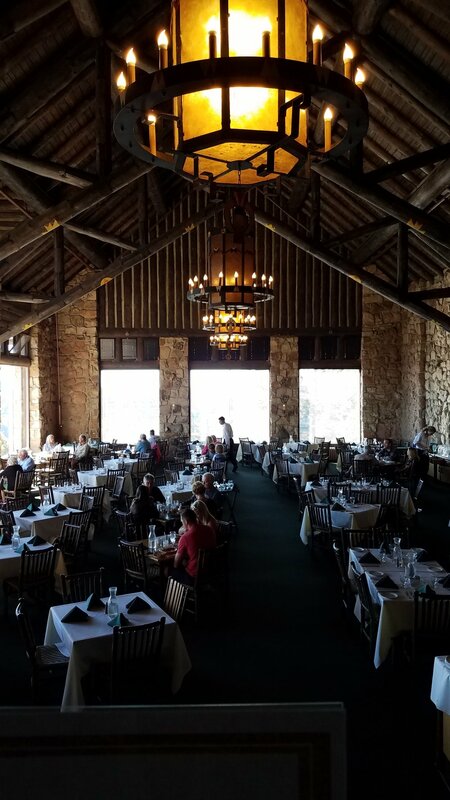 We are only staying one night on this “do over” trip so we enjoy dinner in the re-modeled historic lodge and drive a few miles out of the Park for a good night sleep at the Best Western. Today, day nine of our adventure, we take the quiet eight-mile hike, Fairyland Loop. 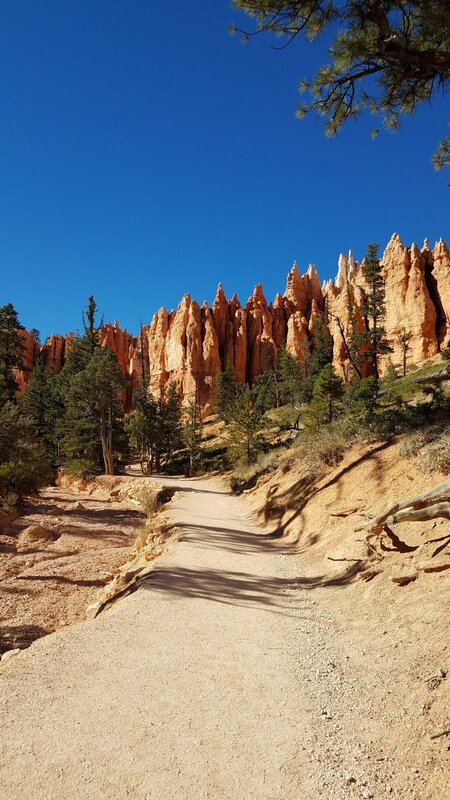 We walk along the rim with views galore for 2.5 miles and then down into Fairyland Canyon. The hike back is UP and over China Wall but at 8,000 feet, the sun is pleasant. The trail follows the canyon floor and then gradually takes us back up to Sunset Point. Afterwards we leave for our 125-mile drive to Capitol Reef National Park. Click here for more information on Bryce Canyon and Zion National Parks from our initial visit to Utah. After a wonderful lunch at Burr Trail Grill in Boulder Utah, we enjoy a remote drive, over Boulder Mountain, amid high aspens imbedded in greenery and free-range cows, to the Capitol Reef Resort, complete with Tepees and Wagon Trains. We are in a small two-bedroom cottage with a deck and red rock view. Chimney Rock, a four-mile hike is good introduction on our first day in the Park, but we feel the Chimney formation is a stretch. Gooseneck (curves in the River) Overlook and Sunset Point follow. As always, we go to the visitor center for the movie and my stamp. Capitol Reef is one of the longest monocline’s in North America. Fremont peoples and later Mormons settled in the Fremont River Valley. So, the Park, established in 1971, qualifies for National Park status based on geological as well as cultural significance. We probably have too many educational degrees in the car, but none in geology, so we continue to try to understand what the heck a monocline is. Near as we can glean, it’s a wrinkle, 100 miles long in this case, in the earth, which exposes the historical layers of the Colorado Plateau back millions of years through wind and water erosion. Had we paid more attention we could have driven on the Burr Trail, a dirt road, all the way from lunch, yesterday, to Capitol Reef, 70 miles, but instead we did an out and back from the Visitor Center – Tom loves dirt roads. It appears that the gang can’t give up the chance for one more hike on our last day, so we drive to the Cohab Canyon Trailhead and start up, up, up (all hikes in Utah seem to begin this way) until we get to the unexpected, lovely Cohab Canyon which we meander through gawking at the rock formations and even identifying some new wildflowers. Afterwards, we pack up and drive 220 miles back to Salt Lake City for our short flight. After 1,750 miles of driving, nine days of hiking in five parks (one a “do-over”), it’s time to go home with 47 Parks down and 12 to go! The greenery, shimmering waters of Puget Sound, and a little fall color are a stark contrast to Utah’s red rock, as we approach Sea-Tac Airport. We are so lucky to enjoy traveling to our wonderful Parks, especially with good friends, but we also love returning home to the Northwest!